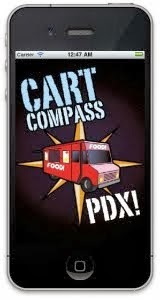 The Knuckle Sandwich is located in the A La Carts food pod in Portland, Oregon. To long-time "food cartivores," this is the old "OmNomNom" truck. John, the owner of Shut Up and Eat, purchased the cart, expanding his business and creating four new sandwiches -- "hoagies as big as your head!" While Shut Up and Eat offers hot sandwiches, The Knuckle Sandwich appears to specialize in the cold, deli-style variety. I ordered the Spicy Diablo ($8): a sesame-seed long roll filled with pepperoni, capicolla, sopressata, pepper ham, pepper jack cheese, hot pepper slaw, parm cheese blend, with mayonnaise, tomato, and pickled peppers. I asked for no mayo in my sandwich. For those that don't know, capicolla is an Italian dry-cured cold cut of pork from the shoulder or neck, generally served uncooked (but can be cooked if desired). It's very similar to prosciutto, but prosciutto comes from the thigh and buttocks of the pig. Sopressata is a flavorful Italian dry-cured salami. I really enjoyed the abundance of dry-cured Italian meats here. The bread, pickled peppers, and the pepper slaw attempted to neutralize the sodium from the meats and cheese. I liked the presentation, with the parm cheese blend acting as snow (well, sorta) on a lovely mountaintop of Mount Meatiness (nice shaved cheese bits...none of this canned powdered factory stuff!). The hot pepper slaw was refreshing and delicious. But it was the toasted sesame seeds on the roll that really set this sandwich apart from others I've had. That extra depth of flavor in every bite made it impossible for me to ignore the glorious bread. Again, it's a sandwich where I'd like a bit of hot sauce on top to give me that extra kick. Also, toasting this sandwich (meats, cheese, and all) would have resulted in lovely toasted bread, melted cheese, and more intense meaty flavors. It's just something about warm, oozing cheese that brings a smile to my face; intact room-temperature or cold slices seem pedestrian and boring.